With a little extra work this could be mounted neatly inside an enclosure and be useful for budding musicians, sound-effects fans or irritating people. Furthermore this kind of project shows that the Arduino world is more than just digital inputs and outputs - so to get started visit the project page here for the circuits and Arduino sketch. And we're on twitter, so follow us for news and product updates as well. 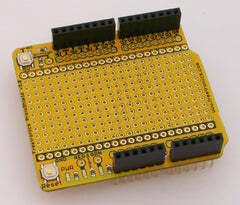 When creating projects with external circuitry to work with an project - consider our range of ProtoShields. From the tiny LeoStick to the Mega range, we offer a complete range for you to work with.